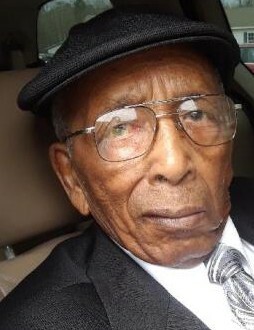 Mr. Charlie Rufus Kemp, 85, of 101 R. Kemp Dr., St. Pauls, NC; died Monday, March 18, 2019, at Carolina Rehabilitation Center, Fayetteville, NC. Survivors: 8 daughters, Rev. Anna Maynor, Regina Rozier, Sandra Sinclair, Senora Rozier, Peggy Bell, Geraldine Colvin and Harriet Esters all of St. Pauls, NC, Annie Mae McMillian of Hope Mills, NC, 4 sons, Reginald Kemp of St. Pauls, NC ,Michael Kemp and Legrant Kemp both of Tar Heel, NC, Christopher Stevens of Fayetteville, NC, 4 very special grandchildren, Taquanna L. Kemp, Tynetta S. Kemp, Antwann L. Kemp and Quanitina C. Kemp, 17 grandchildren, 34 great-grandchildren and 4 great-great-grandchildren. Visitation: Family will receive friends at the home. Funeral: Saturday, March 23, 2019, 12pm, at Second New Light Missionary Baptist Church, 3225 Purdie Hall Rd., St. Pauls, eulogy by Rev. Fredrick Culbreth. Burial: Goodman Cemetery, Tar Heel, NC. Viewing: Friday March 22, 2019, from 4-6pm, at Johnson's Funeral Service, and Saturday, March 23, 2019, 11am-12pm at the church.